We’d love your help. Let us know what’s wrong with this preview of April Drools by Amy Maurer Jones. Hardy Hunter, here (your favorite werewolf). Welcome back to Mundane High. Sadly, not much has changed since Valentine’s Day. You’d think my vampire BFF dating the very human captain of the football team would have made life a little easier for a supernatural at Mundane High, but no such luck. Samantha and I are still lonely outcasts looking for love in all the wrong places, but that’s no surprise. The vamp always gets the girl (or guy, in this case) in Hollywood, but what about the werewolf? Yeah, not so much—unless there’s a new she-were in town. Claire Crescent is beyond beautiful, and I haven’t failed to notice. Unfortunately, my human male counterparts haven’t either. Making everything more complicated, the mate Claire left behind at her old school still haunts her heart. For the time being, I’m playing it smart by offering Claire my friendship. I pray, after time, my friendship with her will develop into something deeper. To ask other readers questions about April Drools, please sign up. I don't rate my own books but I had a lot of fun writing this and hope you will enjoy reading it! It's quick and fun! I adored April Drools! Of course there goes my theory of Hardy secretly crushing on Rhapsody. April Drools picks up a few months after Vampire Valentine takes place and our favorite couple Rhapsody and Reese are still together. This time, we get Hardy’s story and oh what a story it is! Our three favorite supernatural beings are still misfits, even though the school has become more aware of them now that Rhapsody has been dating Reese. When the new girl, Claire, enrolls, every male has eyes for he I adored April Drools! Of course there goes my theory of Hardy secretly crushing on Rhapsody. April Drools picks up a few months after Vampire Valentine takes place and our favorite couple Rhapsody and Reese are still together. This time, we get Hardy’s story and oh what a story it is! Our three favorite supernatural beings are still misfits, even though the school has become more aware of them now that Rhapsody has been dating Reese. When the new girl, Claire, enrolls, every male has eyes for her and Hardy isn’t the exception. Taking one look at her, our favorite werewolf just turns into putty and he’s a bit upset when Rhapsody and Samantha approach her. Only because he’s not sure of what to make of her. Claire isn’t too thrilled to learn she’s one of four supernatural beings now enrolled. At her old school, they pretty much dominated the scene. Claire and Hardy quickly become fast friends, but when a fellow student begins to ask her out, Hardy’s temper flares because he’s protective of her. The two quickly become an item, but when they run into Claire’s ex-boyfriend at a local theater, will Claire’s feelings change? I’m keeping quiet about the ending, but I had so much reading April Drools. Hardy is such a great character and Jones does a great job with his voice. I love the interaction between Rhapsody and Samantha with Hardy. The three truly are friends and as you read, you can easily feel the comradeship the three have. Rhapsody calls Hardy Fido with Samantha laughing along calling him Fee-Fee too. I really liked how Rhapsody and Samantha welcomed Claire into her inner circle. Ask anyone who has moved, it’s not easy being the new kid and to have two people welcome you with open arms is heartwarming. I felt Claire’s uneasiness at first and here Jones showcases how well she’s familiar with students. 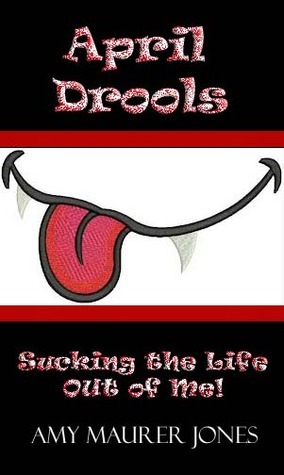 April Drools is a fun read! If you haven’t read Vampire Valentine, I recommend it so you’re familiar with the characters. It’s okay to pick this up and dive right in if you’re so inclined. Great book! I enjoyed it a lot. This is the second book in this series, which began with a Valentine's Day book. It follows a trio of high school friends. One is a vampire, one is a werewolf, and one is a witch. A truly delightful read, and I look forward to the next one. Amy Maurer Jones has been happily married to her own version of Edward Cullen for sixteen years. She and her soul mate, Kelly, live in Tabor City, North Carolina with their two beautiful children, Olivia and Keaton. When Amy isn’t reading and writing, she teaches high school theater arts and dance. To say that Amy has a flare for all things creative would be an understatement, just don’t ask her to Amy Maurer Jones has been happily married to her own version of Edward Cullen for sixteen years. She and her soul mate, Kelly, live in Tabor City, North Carolina with their two beautiful children, Olivia and Keaton. When Amy isn’t reading and writing, she teaches high school theater arts and dance. To say that Amy has a flare for all things creative would be an understatement, just don’t ask her to assemble anything that requires instructions or sadly, you will be out of luck!